WATER VIEW HOME IN PINEHURST!! 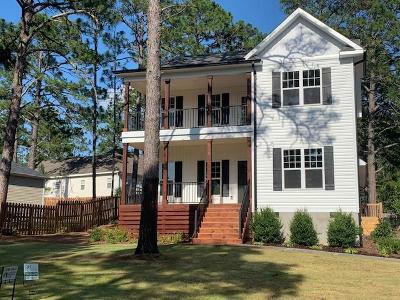 This is a home with southern charm with all the modern amenities! Gorgeous 2 story with a large lower covered porch and a large covered upper porch. Very open floor plan. The master is on the main floor. Has an exquisite custom walk-in closet and a large tiled shower. Upstairs you can find 3 bedrooms & 2 full baths. Each closet is a built-in dream! Fire place in the living with built-ins on each side. Hardwood staircase. Side entry garage. Crown molding throughout. Granite counter tops. Custom bench/storage at garage entrance. It really is a must see! !